Large-format graphics with photographic-quality results—we can help you master it. Need an affordable way to print on-demand large-format graphics with photographic-quality results? 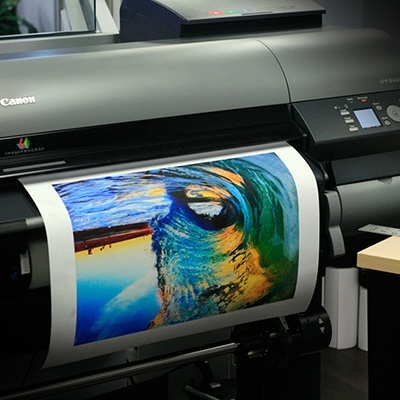 Datamax offers Canon’s ImagePROGRAF innovative lineup of wide-format printers that provide businesses with an efficient, productive, and cost-effective method for producing wide-format graphics with superior color fidelity. ImagePROGRAF was created with the same signature craftsmanship that goes into creating the greatest Canon cameras in the world, providing a direct line between the light that’s captured by professional photographers and the ink it’s shared through. Graphic Arts: Perfect for photography, proofing, fine art reproduction, and print-for-pay. Technical Documents: Print impressive CAD and architectural, engineering, and construction documents. High-Speed Processing: Print ultra-high-quality images with incredible speed. Advanced Inks: Print with an unrivaled color gamut of durable, fade-resistant inks. Integrated Software Solutions: Expand capabilities, simplify use, save time, and improve productivity with Canon’s dynamic software technologies. Canon wide-format printers can also be paired with Canon multifunction devices that have Universal Send capability to create dynamic scan-to-print workflows—making the creation of enlargements quick and easy. To learn more about how to select and master wide format printing, let’s talk!